I have been meaning to let you know how well I am doing after my toe joint replacement. I am doing yoga and karate again. The physical therapy was helpful. My goal was 45 degrees movement and I got to almost 55 degrees. I want to thank you for helping me. It is nice to be pain free. I just wanted to thank you for your professional, friendly and thorough help with my foot problem. I am wearing the custom orthotics, doing the exercises and am ab le to walk again with very little pain. Thank you for your help. Everyone is very kind; the office is run in a very fine manner. Dr Hatfield is delightful and very professional. Outstanding medical care for a first visit. All office staff highly professional and efficient. Doctor most impressive for technical ability and demonstrating genuine concern for patient. I always feel welcome, and the office is always accommodating to my schedule. I Love Dr, Hatfield's office. All the ladies r very sweet and helpful. Dr Hatfield is very kind and helpful. Very efficient front staff, The doctor was prompt with examination and good explanation of diagnosis. I'm completely astounded by how nice this office is. Staff is fabulous! I have complete faith in Dr. Hatfield and all his expertise. Very punctual, you come in and come right out. Nice staff very friendly and efficient. Dr. Hatfield's office is extremely efficient, his staff of help, Jenny, Lisa, Kelsey, and Sandy. They are always friendly and very busy at work. As a patient, I appreciate this kind of assistance and treatment. My visit to the doctor's was wonderful. I was greeted warmly at the door and Dr. Hatfield took the time to pinpoint the pain I had in my foot. Dr Hatfield has cared for toes for years now. the clinic is clean and his staff are both knowledgeable and professional. One of the most helpful staffs I have ever dealt with. Surgery was quick, painless, and thoroughly explained. 5 stars for the front desk representatives to Dr. Hatfield himself. I would give them 6 stars if that were an option. Welcome to our office. We're grateful that you've chosen our office to help you with your foot problems. We do our best to provide quality, prompt and courteous medical and surgical care. We've designed this website to answer frequent questions that potential patients will have when exploring their foot care options and trying to determine what their condition may be. We also hope that you will notice the scope of practice we offer as demonstrated by our commitment to using the most modern techniques to give you the best result with the most comfort. The Encinitas Podiatry Group has been serving the North San Diego Coastal area since 1978. Dr. James Hatfield is a a board certified foot and ankle surgeon that treats a wide range of foot and ankle problems. We take pride in having the best equipped office in the county to handle your foot problems. We maintain a comprehensive, state-of-the-art facility to deal with the diagnosis and treatment of a wide range of foot problems. 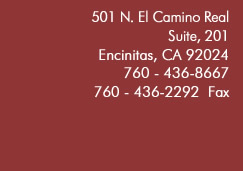 The office is located conveniently on El Camino Real, a few blocks north of Encinitas Blvd. in Encinitas. Drs. Hatfield maintains surgical privileges at The Center for Surgery of Encinitas which is located one half block south of the office and Scripps Memorial Hospital, Encinitas - one mile west of the office. We have a large armamentarium of treatment options for dealing with heel pain. Cryosurgery is a new minimally-invasive procedure for the management of Plantar Fasciitis/Heel Spur Syndrome and Neuromas. A non-invasive therapy for resistant heel pain patients that uses high frequency sound waves to relieve chronic heel pain. A non-invasive therapy for Musculoskeletal pain using light energy to reduce pain and inflammation. Peripheral Arterial Disease (PAD) is a common finding in podiatry practices. It is usually caused by a narrowing or occlusion in an artery within the leg at a certain level. Encinitas Podiatry Group offers custom, orthopedic shoes which are measured and selected right in our offices.